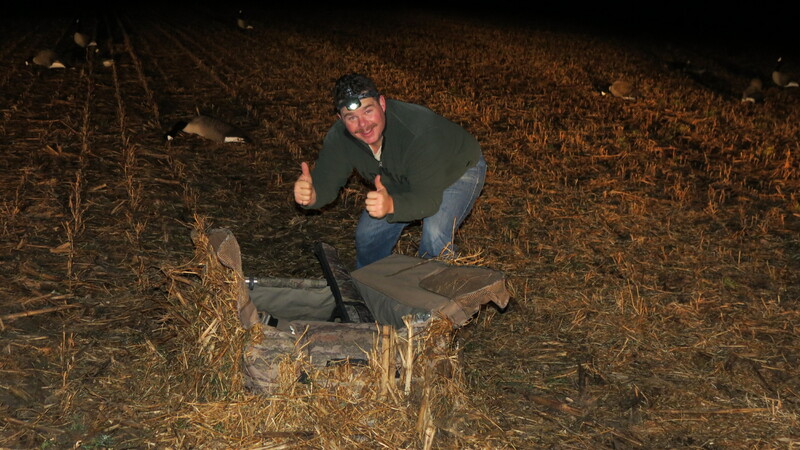 Jason and his brother Maurice arrived at my house for a morning Canada goose hunt on time at 4:30 am, Saturday morning, October 12th. As is all so often the case with my waterfowling expeditions there was confusion which caused momentary delays. Jason forgot the keys to the trailer stored in my driveway for the time being. The ball on my trailer hitch is not the same size as the ball on Jason’s trailer hitch. This required a couple of return trips to Jason’s house to sort out. We were about 15 minutes late departing, not too bad. A fog had descended on the area we were hunting which made finding our bearings in the harvested bean field difficult. I navigated as best I could and we set up the five layout blinds. I found a mouse perched on the top of the head rest of my blind. I left him unharmed. We were in position in time for the start of legal shooting time at about 6:45 am. 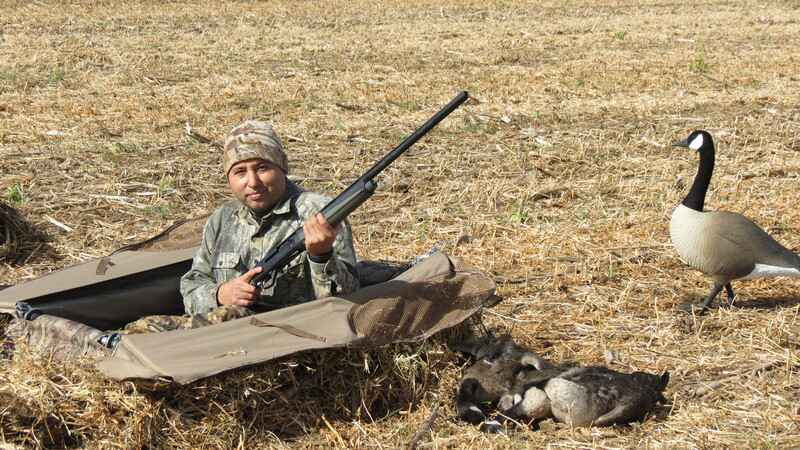 Before long a lone Canada goose responded to my calling, decoyed and Jason killed it cleanly with his second shot. Nos made the retrieve. Next a small flock made a pass and one bird landed in the decoys. These were local birds who have been shot at since the beginning of September so they were very wary. Still there were a few, like the one that landed in the decoys, that were sufficiently habituated to humans they failed to appreciate the peril they faced in decoying. I was concerned that the migration of northern birds did not seem underway that we would have few opportunities. Sure enough, we had several flocks approach, then flare before they came into range. We heard several salvos of shotgun fire in the distance. We cannot be certain, but our impression was that it was yahoos standing in a hedgerow or cornstalks, blazing away at passing geese well out of range. They were hoping if they filled the air with shot they might scratch down a bird or two. After several flocks approached and flared, we took stock of our situation. We had five layout blinds in a row in a bean field. It is hard to conceal layout blinds in a bean field even when there is plenty of chaff. We decided to move the blinds 20 yards away from the decoy spread and adjusted the decoys, a mix of goose shells and full-bodied decoys. Sure enough, once that was done, we had a few more flocks decoy and pass within range. 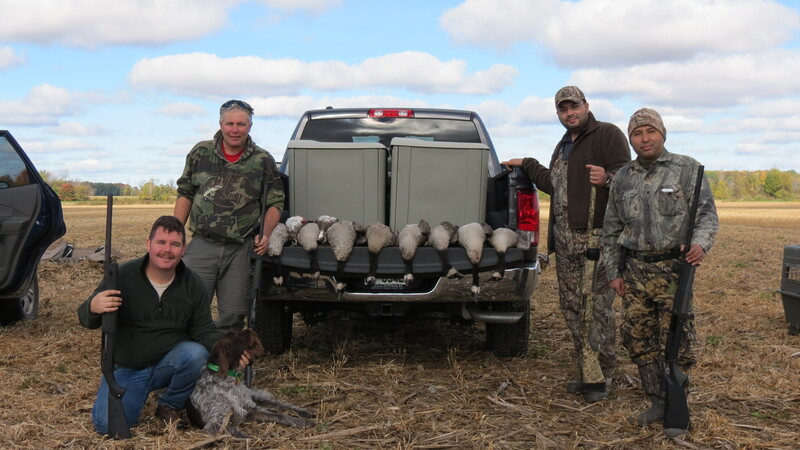 The fact remained the geese were not especially interested in the field we were gunning. It had been harvested the day before and there was plenty of waste beans for the geese to eat, but they had long since found fields in the area they could hang out without getting shot at. By the end of the morning flight we had eleven birds down. The eleventh bird was taken by Jason after we had gotten out of our layout blinds and I was walking back to get the car. I heard a shot, turned around, fearing someone had forgotten to eject a cartridge from his breech, but saw Jason grinning and a goose on the ground. The hapless yearling Canada goose, likely hatched in the suburbs surrounding Ottawa, decoyed without hesitation, with hunters standing in the open and was killed cleanly. 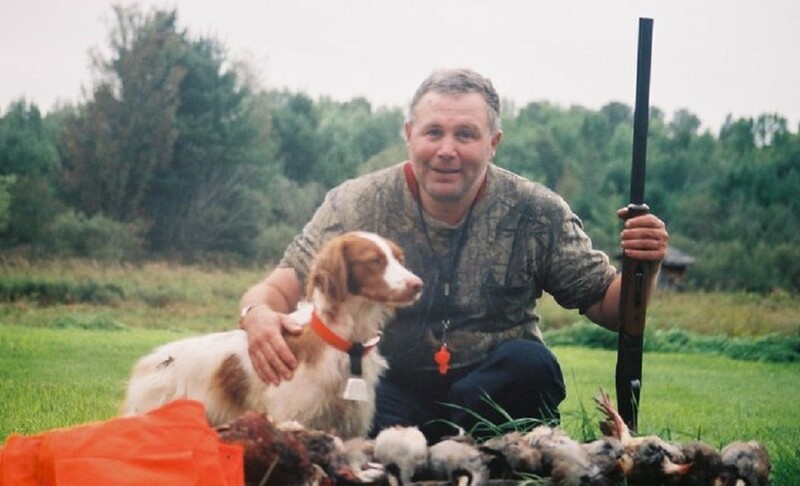 This entry was posted in Canada goose hunting, Gun dogs, Hunting dogs, Pointing dogs, Retriever and tagged autumn migration, Baikal shotgun, bean field, Browning BPS shotgun, Canada geese, Canada goose, Canada goose calling, Canada goose hunting, German Wirehaired Pointer, German Wirehaired Pointer Nos, hunting season, layout blind, migration, pointing dog, soybeans, trailer hitch, waterfowlers, waterfowling on October 15, 2013 by geoffreyandmika.